WASHINGTON  What is happening to the Democrats? Captivated by a handful of liberal superstars, they are venturing where the party has long feared to tread: Steep taxes on the rich. Abolishing an immigration enforcement agency. 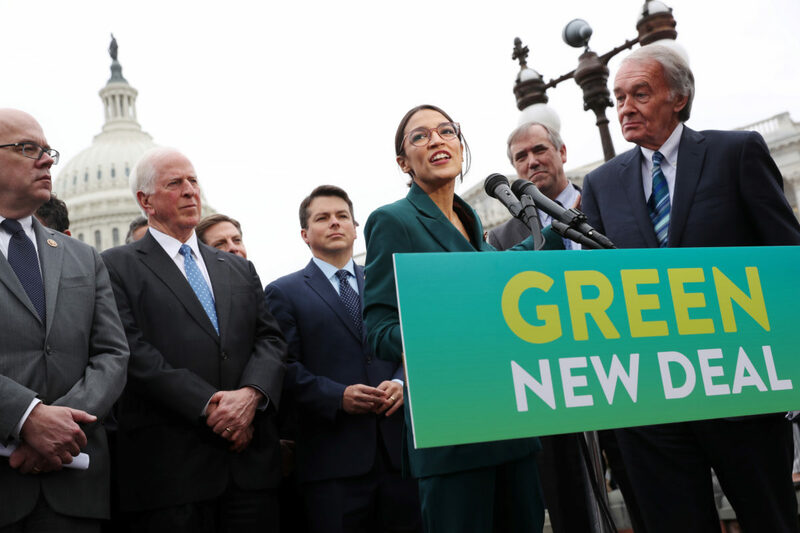 And proposing a sweeping Green New Deal that calls for an economic transformation to combat climate change. As the liberal flank celebrates its sudden ascendance in the party, energized by the new House freshmen pushing the party toward bold policy solutions, others wonder if the Democrats are veering so far left theyre about to fall off a cliff. Its a valid question ahead of a presidential primary season with an unusually robust roster of contenders trying to wrest the White House from President Donald Trump. The race comes at a time of shifting party loyalties and eroding confidence in traditional corridors of power, a dynamic that has recast the policy prescriptions of both parties. The big questions for 2020: Will Democrats move beyond the center-left policies that have dominated the party since Bill Clintons presidency? And if so, will they find the electorate is repelled, as Republicans claim, or will they discover that a country long described as center-right is receptive to a return to liberalism? Democratic pollster John Anzalone said the leftward lurch thats playing out in the Amazon fight wouldnt necessarily hurt the party heading into 2020 and could resonate with voters. A spokesman for former New York City mayor Michael Bloomberg didnt respond to a request for comment. Howard Schultz, another business-minded former Democrat whos now weighing an independent bid for president, also declined to comment. As liberal activists across the country welcomed Amazons decision as a fresh demonstration of the increasing power of the Democratic Partys far-left wing, Republicans highlighted the same thing, using the situation to cast the modern-day Democratic Party as extreme. Following Trumps lead, they pepper their speeches with claims that Democrats are veering toward socialism. Now, thousands of #New Yorkers will be deprived of good paying jobs at #amazon because of socialists like @AOC  and unfortunately the promise of a #greenjob wont pay the bills, former Trump aide Sean Spicer said on Twitter. On Capitol Hill, its hard not to compare the arrival of Ocasio-Cortez and the emerging Democratic divide to the tea party class of 2010 that took control of the House and pushed the Republican agenda rightward, ultimately helping give rise to the politics of Trump. Its not just Ocasio-Cortez. She and House colleagues  Reps. Ilhan Omar of Minnesota, Rashida Tlaib of Michigan and Ayanna Pressley of Massachusetts  jointly announced their opposition to the bipartisan border security deal. They want to cut the Department of Homeland Securitys budget over the administrations deportation policies, including those that separated families at the border. The four lawmakers were urged on by activists outside the Capitol, protesting whats seen as ICEs unnecessarily harsh deportations and raids against immigrants here illegally. Omar, who is Muslim-American, pushed the party further into conflict this week with comments about Israel that were widely seen as anti-Semitic. She apologized. But the questions she and others are raising about the longstanding U.S. ally reflect a growing unease among some Democrats with Israels treatment of Palestinians. House Speaker Nancy Pelosi says the Democratic Partys diversity in the House is its strength, as evidenced by the way her caucus held unified against Trumps demand for money from Congress to build the wall on the border with Mexico. This week, when the Republican leader of the Senate, Mitch McConnell, announced an upcoming vote on the Green New Deal climate change plan as a way to force Democrats into an awkward vote, the Democrats responded, Bring it on. They say Americans want answers on climate change, and Republicans have none. Sadly if the economy enters a recession the muddled middle will go left in the election not realizing of course the full ramifications of their stupidity. Will Democrats move beyond the center-left policies that have dominated the party since Bill Clintons presidency? "Center-Left"??? Only died-in-the-wool leftists would believe that Dems "center-left" policies have dominated the past 25 years. Authors Steve and Lisa revealed their (expected) leftist biases with that ridiculous statement. Demonicrats are little concerned over voters as they can make nice fresh votes for what ever they want. I only know of two positions in the political spectrum. Left: 'Rats, enemedia, AOC, Pelousy, Shoe-more, Baker and Weld (MA), enabling RINO's (GOPe). Center: Trump, GOP (Cruz/Lee/Meadows/Gohmert/etc), FR, Jim Lyons (MA). Washington/Adams/Jefferson/Lincoln/Reagan/Madison. That is all. There are no other points on the political spectrum. The left-leaning media says as mildly as possible that “Democrats lean left”. These totalitarian politicians are better described as the Ctrl-Left, an exact parallel to what the media calls the “Alt-Right”. I hope and pray that voters will not choose slavery under globalist socialism. If voters do make that mistake, I pray that the God-given rights included in the Bill of Rights to protect the people against such a disaster will serve their designed purpose - protecting freedom and restoring the rule of law under a limited government. Yes. Those under 30 yrs. old. Like Lemmings following Lemmings over the Clift. We can Hope anyway. "... the residents of Queens, New York are cheering that the jobs they could have had with Amazon are gone"
CORRECTION: A few "unwilling"-to-work Queens residents, plus a number of Soros-funded "grass roots activists" bused in from out of town, cheered on the loss of local jobs that they would never have applied for anyway. Leaning left? It’s more like taking off in a gallup. And, yes, it’ll cost them the Independent vote and the capitalist slice of their own party. It’s suicidal. It won’t take a recession. Public schools have been turning out 2 generations of really really lefty kiddos now. Their voting patterns are starting to take effect. It won’t be long now before we HAVE a green new deal. Three billion in tax breaks cost nothing. If Amazon comes in and gets 3 billion off their taxes but earns enough to pay 3 billion and 5 dollars, the municipality has 5 dollars more than they had before. Meanwhile thousands of people working and committing commerce in the municipality spend money that generates tax revenues far in excess of the taxes paid directly by Amazon. The girl supposedly has a degree in economics which should give her all the expertise needed to develop those facts. I suspect a lot of people are going to get angry with her and I would not be surprised to see her electoral defeat after only one term. As I understand it, NY estimated Amazon would generate $12 billion in tax revenue for the state and agreed to $3 billion in tax breaks — net loss to NY is about $9 billion in new tax receipts. Unfortunately it seems that liberals in the end get everything they want except the corporate agendas and maybe that is alright with their elites.